“Are you sure these people are from Maoxian county? This is my county, but I have never heard of this people group,” asked Jordan, postgraduate student at a Chinese university, during an Xplore study with CMM staff and other Chinese believers. Jordan is the only person in her family following Jesus, and one of the first in her area to commit to following Him. Instead of letting this isolate her, Jordan has instead allowed it to grow her passion for sharing the gospel with her family and her people. Born in southwest China, in a region dominated by Buddhism and animism, Jordan went her whole childhood without hearing the gospel in her mountain city, and probably still would not have heard if tragedy had not struck in her area. In 2008, a devastating earthquake hit Jordan’s city, killing thousands, and leaving many wounded and without homes. At this time, many nonprofits and aide organizations entered the region to help rebuild. It was then that Jordan met an aide worker who shared the gospel with her and watched God open her eyes to His heart and His truth. 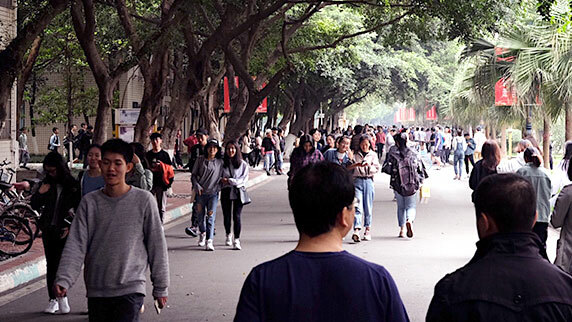 Later at her university, Jordan joined an Xplore study led by members of the CMM’s mobilization team in China and was eager to absorb whatever truth God had for her. Jordan gathered with two other Chinese Christians and two CMM mobilizers each week to walk through Xplore and discuss what God was teaching them. At the end of each lesson in Xplore, there is a small excerpt about an unreached people group that represents one of the five major world religions: Tribal/Animism, Hinduism, Unreligious, Muslim, and Buddhist. One week, as we began reading about a group representing the unreligious, the Ming people, there was an air of uncertainty in the room. As they read about how the Ming people are an unreached and unengaged people group in Maoxian county of China, Jordan suddenly stopped the group. She was from Maoxian county and had never heard of these people. She could not believe they existed! They then went to the Joshua Project, a website that catalogues remaining unreached people groups, to further research the Ming people. As they read the location, dress, customs, and statistics of the Ming people, Jordan’s eyes widened. She had seen these people, but always assumed they were just a part of her own people – she didn’t realize they were a people group all their own. Everyone was shocked to hear the white turbans used to describe the Ming people were white turbans Jordan had seen every day at home. She then began to reflect on the countless hours she has prayed for God to make missionaries and other Christians aware of her own people, her county, China; and she was filled with praise and thanksgiving that the Father had heard her prayers and was making her people known through organizations and resources like Joshua Project. Jordan was overwhelmed with the fact that God had heard her cries and had been faithful to her people, that He had not forgotten or forsaken them, but instead was bringing light to each and every people group He formed in His creativity. Everyone left the Xplore study that week with a new understanding of how God was unfolding His plan for this world, and how He wants to use each of us. Jordan’s faith increased as she saw God answer her prayers, but her motivation to see all people reached also increased as she realized the proximity of the unreached and the accessibility she specifically has as a member of this county to reach people groups like the Ming. Join us in praying for Jordan and other believers to continue having soft, teachable hearts to receive what the Lord reveals to them about His global purposes—and for the faith, courage, and boldness for them to follow in obedience wherever He leads!